This is a great observation. Clearly, bandwidth and synchronicity matter. But what about the relationship between messaging media cost, the time needed to develop it, and its ability to effectively saturate a large population? Is it possible to create effective memes and circulate them widely through 140 character messages? And what about the impact of all of these factors on future social media functionality? 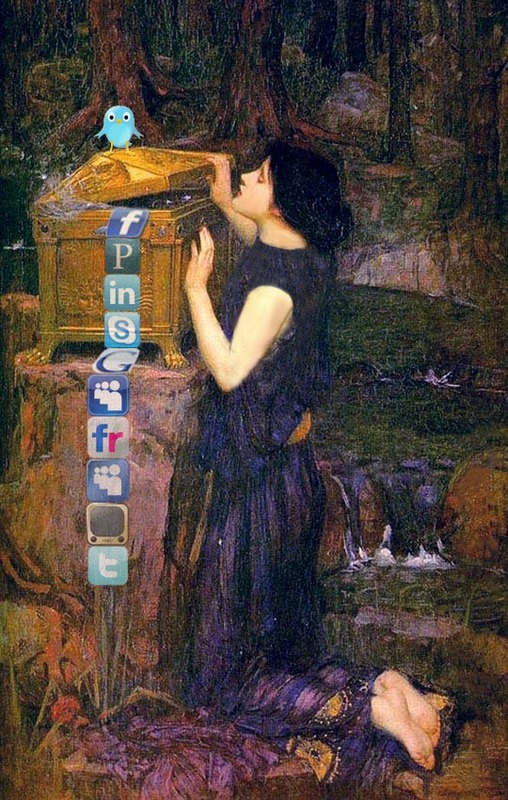 Is social media headed towards platform convergence or towards divergence? Consider a typical Hollywood mega blockbuster like the Pirates of the Caribbean: At World’s End. This 169-minute long meme bomb carries an enormous amount of content. Every scene was carefully designed to keep audiences glued to their seats. Its production took two years, it required the creative talents of hundreds of individuals, and it cost about $300 million dollars to make (roughly $30K per second of movie). It grossed over $963 million in revenue, which amounts to 320% return rate—not pocket change by any means. 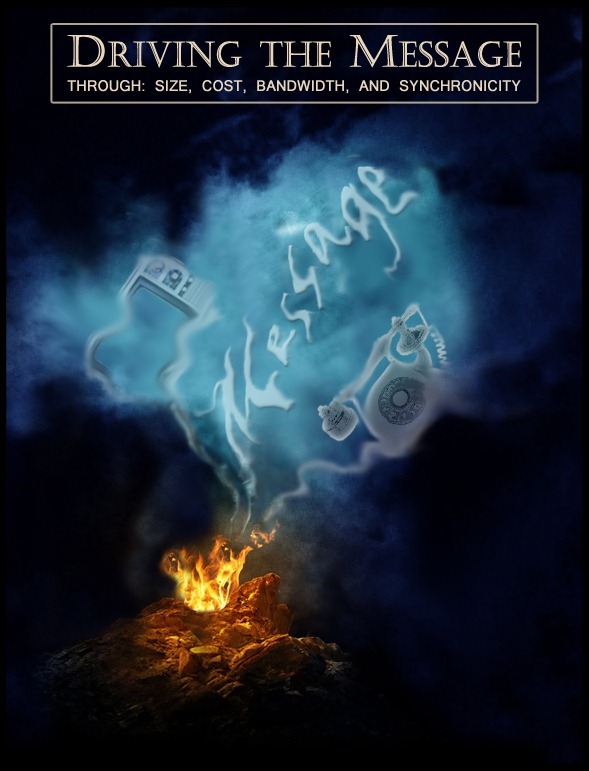 The movie messaging medium is so well optimized that it is capable of generating a significant amount of secondary revenue and reach worldwide audiences by sheer inertia. Just think about all the spinoff industries that spring into life when a major movie like this comes out: toys, music, party accessories, food, costumes, books, etc. If you follow a reasonably well proven formula, (standard plot, big name actors, expensive sets, and lots of special effects), you are almost guaranteed at least a 2:1 ROI ratio and a good chance of producing a number of sequels to your masterpiece. So it does seem that there is a correlation between how much content is packed into the message and its memetic effectiveness. The movie messaging model (see quadrant 1 in the graph below), is based on a tremendous investment of time and resources. The strategy is to build the best product possible, market it well, and then fire-and-forget it. The forget part has to do with the passive nature of this medium; the audience has no interaction with the content and consumes the messaging passively. On the other hand, social media messaging like blogs, e-mails, Twitter, etc., (see quadrant 3 in the graph above), can be produced instantly and with little investment or skill. But it’s also difficult to get a quantifiable ROI from it, (ergo, the raise of snake oil salesmen social media marketing gurus). Another observation is that synchronous social media messaging depends on an interactive and free feedback loop. Users demand the ability to interact in near-real time with their network, but they refuse to pay for the privilege. From an evolutionary point of view, it seems that the quadrant 1 and 3 messaging mediums represent a form of r/K selection classification. Each trades between quantity and quality. 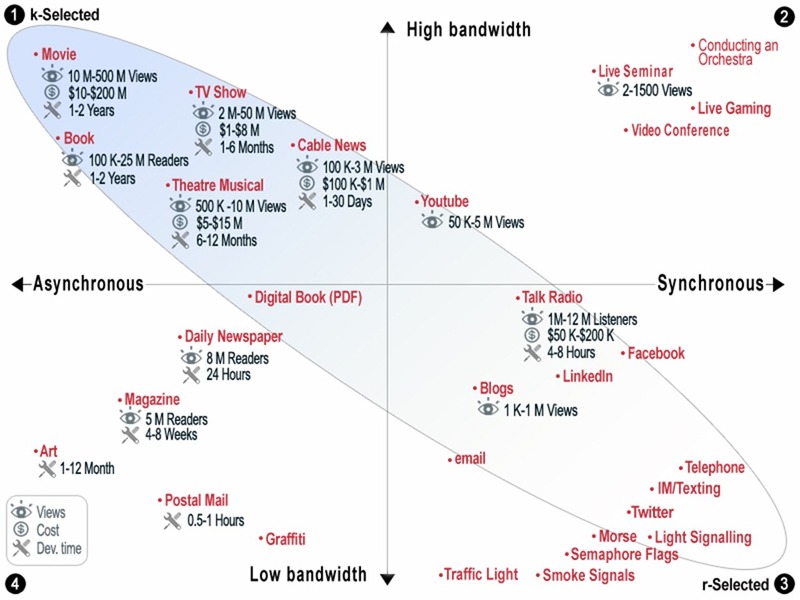 The focus in quadrant 1 is to increase the quality of the content with higher expense per message. The focus in quadrant 3 is to increase the quantity of the content with a corresponding reduction in quality and lower expense per message. The chart data suggests that there is an inverse relationship between the effectiveness of content distribution and the viewer’s exposure time to the message. It seems that quadrant 1 messaging mediums are the most effective in terms of meme creation, distribution speed, and outreach. Content developers are aware of the limitations of each medium and have developed interesting coping strategies (sometimes reversing r/K selection) in order to leverage various messaging toolsets to promote their content. For example, the K-selected movie, television, theater production, and book publishing industries leverage social media primarily to get a short term engagement with potential audiences. The ultimate objective is not to create a long term social community, but instead to lure users in to consume their product. Once the product is out on the market, most of the related social media interaction around it stops. Thank you for being friends of Bobinsky…Have beet and think of me. Until we meet again. Mr B. signing off. In complete opposition to movie producers, the r-selected social media authors use content and platforms like Picasa and YouTube to build long term relationships. Their strategy is to create an intimate family environment that will foster a long term engagement with the target audience. In terms of future direction, there is strong indication that just like Apple successfully consolidated GPS, MP3, gaming console, and phone into a single device, so too the social network platforms of the near future will converge on traditional services. The future social network platforms will yield a service that offers a suite of products like IM, voice and video chat, conferencing, on-line collaboration, e-commerce, content subscription, and personal reputation management, sort of a LinkedIn/Facebook/Pandora service with hybrid Skype and PayPal/Google wallet-like capability. And all of this optimized and available on a mobile device. The only question that remains is will this future platform be built on top of one of the current products or will it be mashed and/or assembled from existing services. © Copyright 2011 Yaacov Apelbaum. All Rights Reserved.